We hope this new piece of kit will be the least used equipment we have! Inoplas is very pleased to support the work of South West Ambulance Service by hosting a defibrillator for public use outside our premises. Over 3,600 people are resuscitated by ambulance staff every year in the South West because they suffer a pre-hospital cardiac arrest. 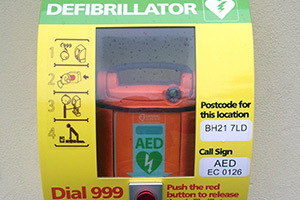 For every minute that passes once in cardiac arrest, a person loses a further 10% chance of survival, and with this dramatic loss in chance of survival, there is a need of a defibrillator every 4-5 minutes walk. Without doubt this availability would improve cardiac arrest survival rates throughout the South West. Modern defibrillators talk to whoever is using the equipment to guide them safely through the process and two of our staff have also been trained to use it.